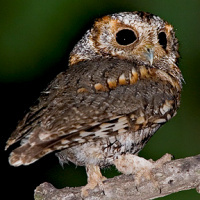 The Flammulated Owl is a small owl with cryptic plumage and small ear-tufts. There are rufous and greyish morphs, as well as intermediates. 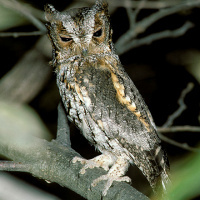 It was previously in the genus Otus and is also known as the Flammulated Scops Owl. The species name flammeolus is Latin for "flame-coloured", refering to its unique colouration. Typical call - Klamath Mountains, Northwest California, USA. © Bruce Marcot. Description: The facial disc is greyish-brown, washed with pale chestnut or rusty-brown. The rim is dark chestnut to blackish-brown. Eyes are dark brown. the bill is greyish-brown, the cere being similar in colour. There are small, erectile ear-tufts. 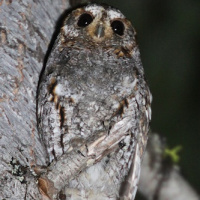 Upperparts are crytic greyish-brown with fine blackish mottles and shaft-streaks. Scapulars have large rusty-tinged areas forming orange-buff scapular stripe. Flight feathers and tail have contrasting light and dark bars. Underparts are greyish-brown, mottled light and dark with rusty spots and blackish shaft-streaks. Legs are feathered greyish-brown to the base of the toes. Toes are greyish-brown and claws blackish-brown. Size: Length 16-17cm. Wing length 133-149mm. Tail length 59-67mm. Weight 45-63g. 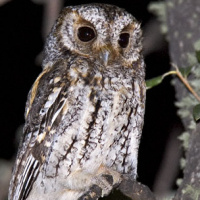 Habits: A nocturnal bird, with main activity just after darkness falls, and sometimes at dawn. 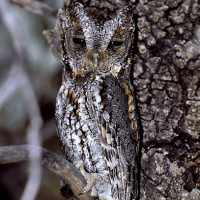 Roosts by day close to tree trunk where it is well camouflaged, resembling a broken branch. They live in pairs. Voice: The main call is a relatively deep woop with ventriloquial effect, repeated at regular intervals of about 2-3 seconds. The call is often preceded by one or two preliminary, lower-pitched 'grace' notes. A similar mating or courtship call is a two-syllable boo-boot call, given at about 1.5 second intervals. When alarmed, this owl will produce notes sounding somewhat like the meowing of a kitten. 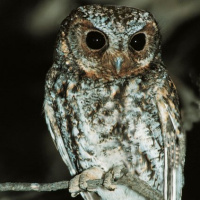 Hunting & Food: Feeds mainly on nocturnal insects and spiders, likely caught in the air or among foliage, but also on the ground or large branches. The most common prey are beetles, moths, grasshoppers and crickets, with caterpillars, other insects, centipedes, spiders, scorpions and other arachnids also taken. Breeding: Breeds in spring. Males sing from their territories to attract females. Sometimes several pairs may nest close to one another, so that borders of territories overlap. 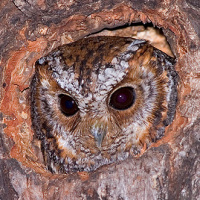 A tree cavity is used for a nest, usually one produced by a woodpecker. They also accept nestboxes. 2-4 white, rounded eggs are laid directly on the dry material on the bottom of the cavity. The female incubates alone and is fed by the male. Incubation begins with the first egg, and lasts 3-4 weeks. After hatching, the young are fed by both parents, and leave the nest after about 3-5 weeks. Both parents continue to care for them for a further 4-5 weeks, after which, the young disperse. 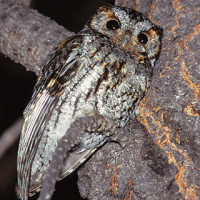 Habitat: Open coniferous mountain forest, especially with ponderosa and yellow pines, quite often mixed with oak or aspen. Habitats generally characterised by brushy undergrowth. Also occupies mixed forest with Douglas fir. Habitats range from 400 to 3000 metres in elevation. 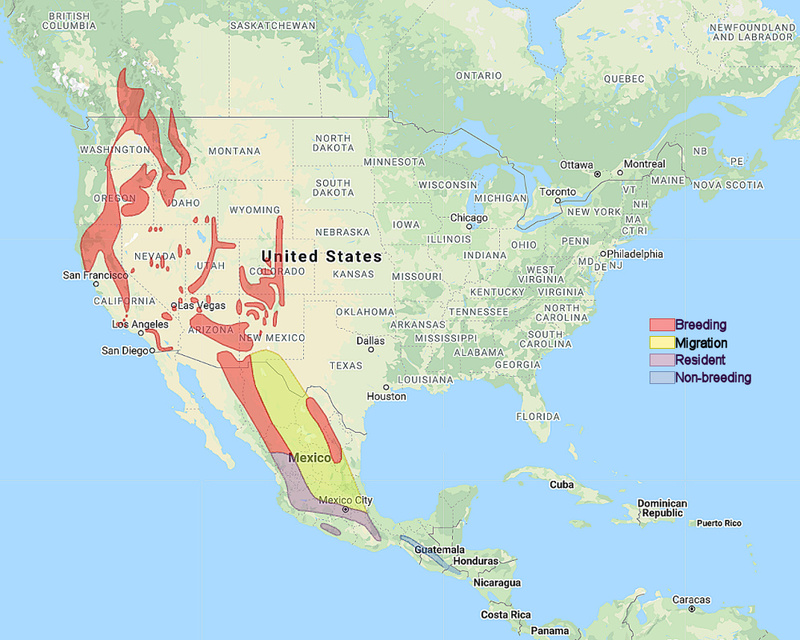 Distribution: North America from British Columbia south along the Rocky Mountains to Mexico, Guatemala and El Salvador. It is only a Summer visitor in the northern parts of this range, migrating south in Autumn in order to Winter in warmer climates. Status: Generally uncommon, but frequent in some areas. Original Description: Kaup, Johannes Jacob. 1852. In W. Jardine (ed. ), Contributions to Ornithology for 1848-52, p. 111. Tyler, Hamilton A. & Phillips, Don. 1994. "Owls by Day and Night". Naturegraph. 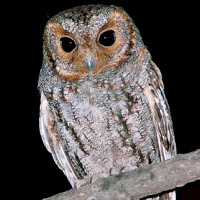 See also: Other owls from North America, Genus: Psiloscops.